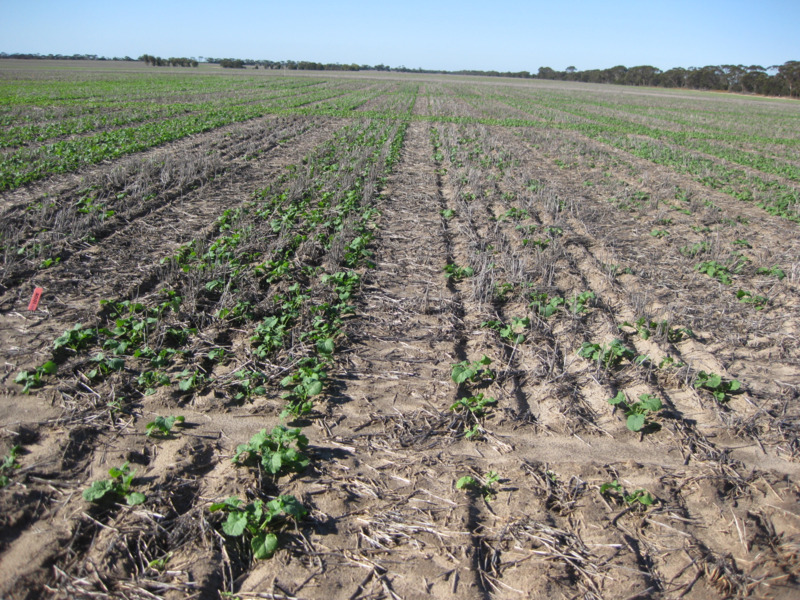 In a 2014 trial, Department of Primary Industries and Regional Development (DPIRD) concluded that it was not worth re-seeding canola. April sown plots, at only five plants per square metre (plants/m2) produced equal or higher yields compared to May sown plots at 5-30 plants/m2. Over a number of years we have also seen DPIRD trials show canola producing 60-80% of maximum yield at around 5 plants/m2 and 80-90% at 10 plants/m2. From this point of view, low plant numbers sown early appears to be an acceptable approach, although weed control may be compromised. Canola is often the first crop sown each autumn. Because the small seed is best suited to shallow seeding it is susceptible to drying soil conditions. If growers don’t get a good break or decent follow-up rains they may have to consider reseeding 2-3 weeks later. The big question for growers is whether they should leave their low density crop (fewer than 10 plants/m2) or re-seed. In 2014, DPIRD conducted a series of trials with plots sown before or at the break of season with plant densities of 5, 10, 15 and 30 plants/m2; compared to plots sown three weeks later with densities ranging from 5-60 plants/m2. At this time we also included some plots sown over the top of earlier sown low density plots. The most successful trial in this series was at the Northern Agri Group’s main trial site at Ogilvie. The first sowing time of Pioneer 43Y23RR was on 29 April with establishment about 90% of our target. The second sowing time was 16 May when conditions were actually drier and less favourable than the April sowing and consequently only established around 40% of our target plants. At this site the resown plots were in offset rows and only just tickled in to reduce damage to the earlier sown plants, which given the dry conditions in May, was not as successful as sowing normally at that time, with only 13% of the target plants emerging and no extra yield produced (see Figure 1). As expected, the April sown plots out-yielded plots sown in May, at every comparable plant density. In addition, April plots that had only 5-10 plants/m2 produced equal or higher yields than later sown plots at higher densities. Over a number of years we have seen canola produce 60-80% of maximum yield at around 5 plants/m2 and 80-90% at 10 plants/m2 in DPIRD trials. From a yield point of view, sticking with low plant numbers sown early appears to be acceptable. However weed control may be compromised at these low densities. For example, in our DPIRD plant density trial at the Liebe Group site in 2013 we observed more ryegrass panicles in TT canola when the crop density was below 20 plants/m2 whilst in the RR hybrid plots we found no effect of plant density on ryegrass numbers. This indicates that if you have a competitive variety such as RR hybrids and effective herbicides such as glyphosate then low crop densities are less of an issue than less competitive crops such as TT canola combined with, in this instance at least, a less effective herbicide system (see Figure 2).